Glasgow Punter: Glasgow Spectator Sports Part 5. Football. I spend most of my time as a spectator of sport in Glasgow at football matches, more specifically at Firhill watching Partick Thistle. With my team being out of action a few weekends in April with international matches on the go and Scottish Cup semi finals, I have been exploring the other sporting offerings in the city in the past few weeks. I took my children along to plenty of other sporting spectacles during the Commonwealth Games last year, but we never really stuck with any of them. Although my children go to swimming clubs, athletics and badminton clubs we rarely go to these sports as spectators. In recent weeks we have enjoyed some sporting imports with Braehead Clan ice hockey matches and Glasgow Rocks basketball. We took in some sports steeped in nostalgia with speedway at Glasgow Tigers and greyhound racing at Shawfield Stadium. On Friday night I was watching Glasgow Warriors rugby team at Scotstoun, before coming back to football the following day. I enjoy watching sport, pretty much any old sport (except maybe Formula 1). In the days when there was less wall to wall sport on television I would happily watch all that was available; horse racing, FA cup finals, the boat race or the wrestling on ITV. When Channel 4 came along that introduced me to American Football, kabaddi, the Tour de France and sumo wrestling. As a child watching live sport usually meant standing at roadsides cheering on my dad taking part in road races and marathons or being taken to see our local football teams in Maryhill; Partick Thistle or Maryhill Juniors. The sport which has hooked me as a spectator ever since is football. I have been going back to Firhill to support Partick Thistle since I was introduced to them by my parents in the late 1970s. I have enjoyed re-visiting some alternative Glasgow sports over the past few weeks, but football is the only one that I really feel any emotional attachment to when I watch it. If there is one sport that is played in all corners of the globe it is football (or soccer if you are playing it in America). Away from the corrupt world of FIFA and its grasping rush to make as much money from the game as it can, viewing the world as "potential new markets", whatever country you are in you can stumble across groups of kids kicking some sort of ball about. It may now have to compete with other sports, with people watching at home on TV and with modern distractions for younger audiences, but it is still the most watched spectator sport on planet Earth. Whenever I am holiday I manage to drift off to locate the local football grounds. If it is out of season and there are no matches on, it still gives you an idea of how local people live and relax. You end up wandering around weird, out of the way residential streets. You read up the local club's history, often intertwined with stories of immigrants or local industries and you can learn about a town or a city in a slightly tangential way. In Greenland I learned about the challenges of internal travel in the country and trying to maintain football pitches in their weather. On holiday in Germany I got a feel for St. Pauli's slightly anarchic neighbourhood in Hamburg. In Greece I wandered around the down at heels ground of FC Aris with their colours reflecting the Byzantine history of the Thessaloniki area. I also visited the stadium of PAOK (Pan-Thessalonian Athletics Club of Constantinopolitans), whose history links back to their roots as a team of Greeks living and playing in Istanbul, before being deported to Greece in the population transfers that happened after World War 1 in the region. In Iceland we saw that the national stadium had more images of women players than men on show, and their nearby pitches had hundreds of children taking part, boys and girls playing together, in a national tournament. These facts may give some clues as to why this small country is soaring past Scotland in the international rankings. 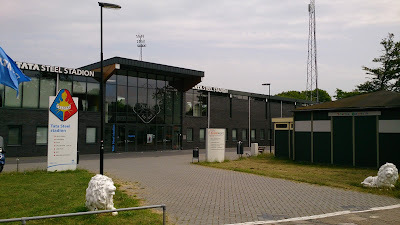 The Netherlands has a team named after the Telstar satellite, who play in a stadium sponsored by Tata Steel when we visited it. Who knew that Tata will continue steel production in their nearby, profit making businesses in the Netherlands after they close their British plants? All these things I have learnt on holiday, because of my mild obsession of tracking down local football teams when I am away. Driving to London last year my son was delighted when I stopped off in Milton Keynes to have a wee nosey at the MK Dons stadium, or in Halifax on the way back up to cast an eye over my grannys's childhood home, and nearby stadium of FC Halifax Town, The Shay. In Glasgow most people are aware that football has a bit of a divisive history, with most people expected to align themselves with either Rangers or Celtic. The absence of their poisonous rivalry has not been missed by everyone over recent seasons (despite what many Sky and BBC journalists claim), with Rangers working their way up through the lower leagues. However, for good or bad, Glasgow's two most well known teams will resume hostilities again in the 2016/17 season. In Glasgow, Celtic Park in Parkhead has a capacity of 60,000 and Ibrox Stadium is able to house over 50,000. 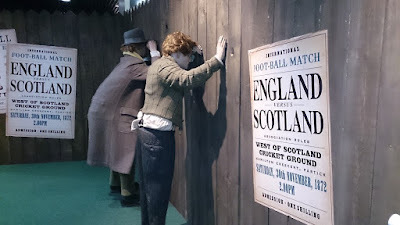 Unable or unwilling, to disentangle football in Scotland from religious bigotry and the politics of Irish nationalism, the Scottish national team cannot realistically be seen to use either of these grounds. It is maybe worth noting that the crowd drawn to watch Scotland does not heavily rely on Old Firm fans anyway. So the Scotland team are based at Hampden Park in Mount Florida, giving Glasgow three 50,000 seater football stadiums. This has been home to Scotland's oldest senior football team, Queen's Park, in one form or another since 1873, six years after their foundation as a team. Although at one time 149,000 could squeeze in here to (try to) watch a match, since it was redeveloped as an all-seater stadium in the 1990s in can now accommodate around 52,000. Most weekends however it is still home to Queen's Park FC and their average home crowd of around 750 hardy souls. Though temporarily out of action for football recently, when it was refitted to accommodate athletics for the Commonwealth Games (quite successfully it has to be said) it has reverted back to being our national stadium. Personally I would happily demolish the whole place. Nowhere in the stadium is there a decent view of the football, the flatly banked former terraces leaving you miles away from the pitch and draining any atmosphere the crowd manages to whip up. Getting to and from matches is always a slog, with roads in the residential streets nearby gridlocked for hours before and after the matches. The only sense of history that can be gleaned from the place is in the wee football museum housed in the main stand. It manages the tricky task of being recently modernised and completely out of date. So if you are not going to Ibrox, Parkhead or Hampden to take in some football in Glasgow, what other choices do you have? Although more and more women and girls are playing football, at higher levels one team dominates in Scotland - Glasgow City FC. I do like the fact that they don't bother with the words "Ladies" or "Belles" or anything in their name. They are just Glasgow City FC. I have taken my children often to see them, more often when they played at Petershill, but we still take in the occasional game at Airdrie's Excelsior stadium where they are now based. The team are in discussion with East Dumbartonshire council, who are planning to build a new community facility which will be the future home for the club. If this happens it will be the first time in the UK a stadium has been built for a women's football team. Formed in 1998 and playing in bright orange, for many years Glasgow City have gone unchallenged, as the rest of the women's game in Scotland has struggled to keep pace with them. In 2012 they won the domestic treble, and won every league match that season. In 2014 they suffered their first league defeat in over six years, when Spartans got the better of them. They have consistently got into the last 32 of the European Champions League, being knocked out by Chelsea last year and by PSG at the quarter final stage the year before. Other clubs are slowly emerging and Glasgow City are regularly pushed by Hibernian in league and cup matches these days. Celtic and Rangers are now also putting some effort into their nascent women's teams. Partick Thistle Ladies' team have recently been formed and play in the SWFL Division 2 Central. To make the matches more competitive the league has been re-arranged with two tiers now, Scottish Women's Premier League 1 and 2, each of eight teams. The league runs from March to October. The Glasgow City team is now coached by one time Aberdeen player Scott Booth, and features many Scottish and Irish international players. Some familiar faces are Irish international Clare Shine and Julie Fleeting and Leanne Ross who have notched up over 200 appearances between them for Scotland. The Scotland Women's team are currently outshining the men's team, on the cusp of qualification for the European Championships. At cup games, friendlies against English opposition and Champions League matches there can be a decent sized and lively crowd, with a large number of families and children present. However when I recently went to see them, on a cold Sunday afternoon in April 2016 when Celtic and Rangers were playing a few miles away, there was a pretty low turnout for a league match against Aberdeen. To get to the stand fans had to come up the tunnel onto the pitch as there was no need to open the concourses of the stand today, which was a bit unusual. Despite the match being rather one sided, City struggled to create decent chances but eventually ran out 1-0 winners. There is still a long way to go before there is a greater level of challenge for Glasgow City FC in the women's game. So far this season they are undefeated in the cup and league and have won their matches 14-0, 1-0, 1-0, 10-0, 1-0, 8-0, 4-2 (the first two goals they have conceded this season). At present I enjoy following Glasgow's top league team, which I am happy to say is neither Rangers nor Celtic. Also my daughter quite likes wearing the Glasgow City football top she has, always a good talking point on holiday. Cost to watch Glasgow City - £5 for adults and free for children. The bigger games can be entertaining and my children certainly enjoy coming along. But on a quieter day like this you do feel a wee bit as if you are intruding on a private affair. Scottish Junior football is not football for children, but since the 1880s is the name given to non-league football in Scotland. The Scottish Junior Cup has been contested since 1886, with an earlier version dating as far back as 1880. Many of the Junior football teams have long histories and great local popularity. Local derbies like Auchinleck Talbot v Cumnock or Arthurlie v Pollok can attract crowds of well over 1000, but nowhere near the 76,000 who attended the Junior Cup Final in 1951. The biggest names in Junior football are the Ayrshire clubs, although Glasgow has many, many teams and was previously a route for players aiming for a professional career, whether it was Bertie Auld going from Maryhill Harp to Celtic, or Bill Shankley starting off in the Glenbuck Cherrypickers. Nowadays it often goes the other way. Most of the first 45 minutes watching a Juniors match tends to be about leaning over to the person nearest you and saying "Is he that annoying wee guy that used to play for St Mirren in the 1990s?" I don't really follow any particular Junior team and this year have pitched up at Yoker Athletic's Holm Park once to see a pre-season warm-up match for Partick Thistle and I went to one Renfrew Juniors match. However I quite fancy going down to Kilmarnock for the Junior Cup Final this year, due to my family's distant footballing links to that part of the world that I've written about previously. Junior football has a reputation for being one of the few sports where fights can start on the pitch and spill over into the crowd, but it has a rich history. The history of Junior football teams is inextricably linked to the rise and fall of industries in Scotland. As new communities grew up around an industry, local teams sprung up, often several within a small area, like Ashfield and Glasgow Perthshire in Possil, with their grounds practically on the same block. This link between the health of a community and the health of its Junior football is nicely drawn in the recently published book Shankly's Village: The Extraordinary Life and Times of Glenbuck and it's Famous Sons by Adam Powly and Robert Gillan. Despite its illustrious history, neither the team, nor the village that Bill Shankly and many others started their football careers at still exist. I heartily recommend the book to you. This year the Junior Cup Final will be played on Sunday the 29th May, 4pm at Kilmarnock's Rugby Park. After Pollok overcame Hurlford last week in front of a crowd of 1600 people in the second semi-final, it will be contested between them and Beith. I have mentioned above that my parents brainwashed me as a child by taking me to Partick Thistle matches when I was young. Whether it was an attempt to keep me away from the Old Firm, or just that old fashioned thing of supporting your local team, I don't know. I have been unable to reverse this early conditioning and been going to Firhill now for the best part of 40 years. Anyone with a bit of Thistle knowledge will see that this means that I have missed their 1971 league cup victory and had to endure the various ups, downs, downs and occasional ups since then as a result this. Younger people who follow big teams probably won't be aware of this, but football always used to be played at 3pm on a Saturday afternoon. Weird, huh? On a Saturday as a family we would just make the short walk to Firhill to see what was happening. At that time the reserve team would play at Firhill when the main team were playing away, so there was usually something to watch. Huddled up on the terracing behind the goal my mum would often prepare a picnic of sorts for us to eat at half-time - no "chewing gum! macaroon!" for us. As a teenager a few of us got into the habit of regularly going to the games together, often my brother, my cousin and my pal Alan who stayed up our flats. Then as a student once I had a car, away games became possible. I know that there are parts of Scotland that I would never have visited if Partick Thistle had not spent so many years yo-yoing up and down through the divisions. Maybe some Rangers fans have just taken their punishment on the chin and got on with enjoying getting to know Scotland a bit better. 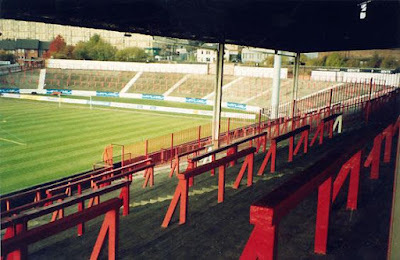 Old entrance to the south terracing at Firhill Stadium. 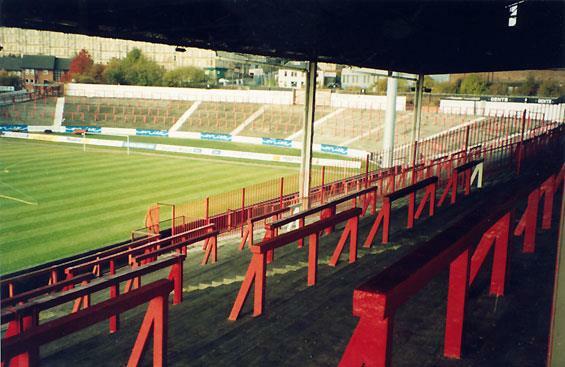 There is much that I miss about the old atmosphere at matches, when opposing fans were separated on the terracing of the Firhill Shed by a fence and hurled abuse, pies and much else at each other across it. However it is easy to forget that the pantomime abuse went too far at times and I don't want to go back to the days of being chased down Maryhill Road under a hail of bricks. For many reasons all-seater stadiums were introduced, alcohol banned and closer police scrutiny were introduced. As the name suggests Partick Thistle have not always played in Maryhill. I have previously written about their early grounds here and here if you have a burning desire to learn more. For much, much more comprehensive information on Partick Thisle, the early years follow the link to the website that carries that very name. As we come to the end of the 2015/16 season Partick Thistle are almost safe for another season in the top division with Kilmarnock and Dundee United favourites to go down or face the play-offs. The fun in all that is that both these teams have previously had a hand in condemning us to the lower divisions. Ever the unpredictables however, no Partick Thistle supporter is believing we are there yet until we are mathematically safe. The problem is that with near bankruptcy in the past, the club have now taken the unusual step of running a club within its available budget. This causes the great difficulty of putting us at a disadvantage against clubs who have decided against this wacky principle. It is for reasons like this that it really becomes infuriating when clubs gain from a form of financial doping, but rarely throw their hands up and say "mea culpa". Maybe it's the Latin that puts them off. With a superior goal difference and a nine point gap at the start of this match it appears too many of the players are thinking about their summer holidays or their next career move. After harrying Inverness for the first 10 minutes Thistle drifted out of it and showed little determination or cohesion. As a result they allowed Inverness Caledonian Thistle to go into half time with a 1-0 lead. As part of their aim at future financial stability Partick Thistle have spent time and effort on trying to develop younger players. With the addition of financial assistance from Chris and Colin Weir this has become part of the Thistle Weir Youth Academy and some of their young players were given the chance of a kick-about at half time. With efforts like this and free entry for children under 16, Partick Thistle are making a concerted effort to (literally?) grow future fans. Other efforts to raise the club profile this year have included free art giveaways to fans (see here for more info) and the creation of the world famous mascot, Kingsley. However all of that effort is harder to maintain with the potential drop in income that the club would face if relegated. So the biggest effort has to be on the pitch. Unfortunately for any young fans we were trying to impress today the team started badly in the first half and then tailed away in the second. Inverness Caley Thistle eventually finished comfortable 4-1 winners (I think that was the score, I was watching through my fingers at the end). With Kilmarnock having a convincing win over Hamilton we are rapidly losing our points and goal advantage over them. Today's match was a disappointment, but I would rather we stop watching football the way Sky Sports market it, as a series of blockbusters. I prefer to see today's match as an episode in a box set. Okay, the bad guy was on top at the end today, but I am already eagerly anticipating the next installment, when the wee guy might get his just reward. Once the season is over, I will sit down and reflect on it a bit. Then a few weeks later, even if I said "never again" after my favourite character was written out, I will be eagerly tuning in again for the next series. American research a few years back has shown that football is the most unpredictable sport to watch, when compared to ice hockey, basketball, American Football and baseball. When analysing 100 years of data from the top English league they found that you were more likely to see an upset by an underdog in football than in these other sports. Their argument was that this is one thing which made it an exciting sport. Sadly they also found that upsets were happening less frequently in the most recent data. This seems to be a result of some clubs now being able to financially out-muscle their opponents. If leagues and super-leagues are set up with the aim of helping the big teams at the expense of all the others, I would say that those big teams are in danger of killing the goose that is laying their golden eggs. In Scotland the league set up seems so skewed to the interests of a minority that the danger is fans lose interest and vote with their feet. Clubs like Partick Thistle struggle to compete in the current financial environment and they are trying to get stability by rooting themselves very much more in the local community at present and I would applaud them for that. There is also clearly a need for some meaningful way to introduce a form of fan ownership to football, to give fans a voice on the daft committees running the game in Scotland. Other actions have inadvertently thrown a wet blanket on any enthusiasm football supporters try to whip up. Football teams seems to be unfairly singled out. It is hard not to see this as a prejudice against the people they draw their support from. The all-seater stadiums and alcohol bans you see at football are not in place at crowds I saw in recent weeks at speedway, basketball, ice hockey or rugby in Glasgow. On occasions when I have gone to watch football in England you are allowed to stand about and enjoy an alcoholic drink in the ground, everywhere except at your seat. I am not trying to say that football needs alcohol, but all the other sports I went to have been able to use bars as another way to draw people to the ground earlier and to generate income, important for clubs often living very much hand to mouth. The Offensive Behaviour at Football Act brought in by the Scottish government was intended to tackle sectarianism at football matches, but has had no effect in tackling this issue at the clubs where it is a problem. Why criminalise just football fans in law, why not just an "offensive behaviour act"? Football can still throw up the occasional surprise. Occasionally a Greece wins the European Championship, or a Partick Thistle wins the Scottish League Cup. When I sit down to watch a match in which I have no great vested interest, unerringly I am cheering on the underdog within a few minutes. The great and the good of UEFA's vested interests may try to mould the shape of football to suit their narrative, but occasionally a team like Leicester City will defy the 5000-1 odds bookies were giving their chances at the start of the season. It's one in the eye for the big bullies, and like many others I will be cheering them on tomorrow against Manchester United. Then I will be back at Firhill, waiting with renewed optimism for our turn to have a big surprise season. "All that I know most surely about morality and obligations, I owe to football."